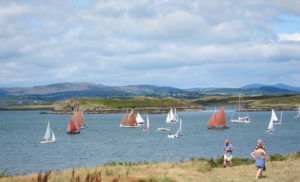 Adapted from Towelsail Yawls:The Lobster Boats of Heir Island and Roaring Water Bay and Traditional Boats of Ireland: History, Folklore and Construction – with kind permission of Cormac Levis. Once a familiar sight in every bay, inlet and harbour on the south coast, the lobster boats of Heir Island and Roaringwater Bay were among the best known and most distinctive fishing boats of the region. 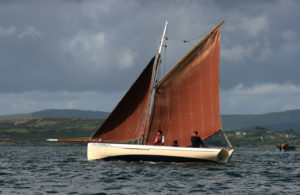 This unique fleet set out under sail and oar each year to fish lobsters and crayfish all along the coast from Dursey Head to Ardmore in County Waterford. Away from home for periods of up to seven weeks’ duration and constantly on the move, the fishermen led a semi nomadic lifestyle, working, cooking eating and sleeping in their small, open boats. At some stage after the Famine, Heir Island became the focus for a new beginning in the lobster fishery. By the 1870’s English fish merchants were sending boats from Southampton to the Irish south coast to buy lobsters and crayfish. It is reported that in 1892, there were 40 lobster boats registered in the Congested District of Baltimore and all of these were concentrated in the electoral district of Aughadown South. Oral tradition tells us that the majority of these were based out of Heir Island. While lobstering was primarily an inshore fishery usually pursued in local waters in four-oar rowing boats, the boats of Heir Island and neighbouring islands, East Skeam, West Skeam, Middle Calf, West Calf, Long Island and Aughadown on the mainland, were gaff-rigged sailing boats with a crew of three. A boat builder by the name of Christopher Pyburn was a frequent visitor to Heir Island where he repaired boats for the islanders. Eventually he settled on the island marrying a local woman. Christopher and his son Richard built many lobster boats on Heir Island in the second half of the nineteenth century and Richard continued to build them into the early years of the twentieth century. Like all traditional West Cork boats, the lobster boats were of carvel construction. They were lightly built with moderate sheer, low freeboard, narrow beam, mildly raked transom and a stem post that curved smoothly from the keel to a near upright position, yet never quite straightened. These features gave them a graceful, streamlined appearance. A typical lobster boat built by Richard Pyburn on Heir Island in the 1890’s measured approximately 26 feet overall, 6 ½ feet in breadth and 3 to 3 ½ feet in registered depth. Just large enough to carry a substantial number of lobster pots and all the paraphernalia required for a long fishing trip, they were small enough to manoeuvre in the dangerous inshore waters and narrow inlets they frequently fished. They were deep enough to sail but, with their light build, low freeboard and narrow beam, they could also easily be rowed. During the 1870’s, a boomless, gaff mainsail and a foresail replaced the original spritsail rig of the lobster boats. From the early 1900’s at least, some lobster boats also carried a jib, and a few fished with almost a full cutter rig of mainsail, staysail, jib and topsail. Even boats that usually fished with just a mainsail and foresail frequently carried a topsail and job for regattas, which were keenly contested. The sails were made by the fishermen themselves from heavy calico or cotton duck. Certain fishermen had a particularly good reputation as sail-makers. The calico was white in colour but after one or two seasons’ fishing the sails were barked to preserve them. The bark was boiled in water and the resulting solution was brushed on with a soft brush. This gave the sails their usual tan colour. From early May, weather permitting, the boats would set off in groups of two or three with a crew of three in each boat. Each boat fished from 24 to 30 lobster pots, depending on the size of the boat. When shooting the pots close to the shore, the boat was rowed. The fishing routine involved hauling the pots about every two hours throughout the day and right through the night. Once the pots were hauled, they were moved to another rocky patch of seabed along the shore or, during daylight hours, out to deep water where they were shot on submerged reef or rock. Great care was taken to keep the catch alive until it could be sold at the end of the week. The only shelter available to the lobstermen in their entire six or seven week fishing trip was a tent of sorts, temporarily erected in the bow when the boat was at anchor. 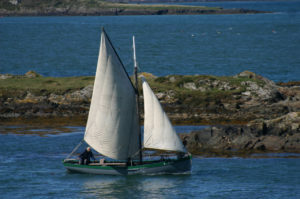 The use of the towel as a sail in certain circumstances was a particularly common practice in the Heir Island boats. Hence, the local term for these boats, ‘the towel sail yawls’. Cooking was done at the mouth of the towel, on an open fire contained in a bastible pot. Bread, baked in a bastible, was the mainstay of a lobsterman’s diet. Fish was usually boiled with potatoes, if they were available. Meat was rarely eaten. One of the few remaining lobster boats from the old towelsail fleet still fishing in the 1970’s was the Hanorah. Built in 1893 by Richard Pyburn, ownership of the Hanorah passed through many hands. Between the mid 1980’s and 1999, she lay in a sheltered inlet near Schull harbour in gradual decline. However 106 years after she was built, the Hanorah was raised from the slime by Nigel Towse of Sherkin and boat builder Liam Hegarty and restored to her former glory. The event was to inspire a revival in the building of lobster boats and several can now be seen sailing the waters of Roaringwater Bay one more and on regatta days, they make a wonderful sight with their traditional lines and tan sails.